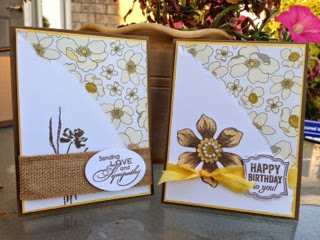 Needing two birthday and two sympathy cards at the same time I thought why not do a one card two ways challenge, twice. First was based on a sample I saw on Pinterest. I liked how the DSP peaks out from behind the top layer. Truly a simple great layout idea. 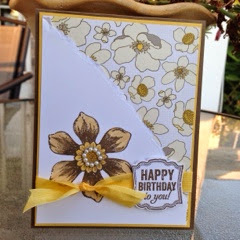 Making cards for other demonstrators is always challenging as I want something fresh for them. Carrie is such a thoughtful person and always happy, I thought Daffodil Delight fit the occasion. The paper used was Park Lane 133694. 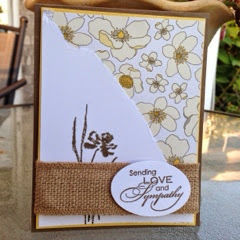 Changing things up just a bit and it's a sympathy card for another demo who lost her grandma. I love this set, Love & Sympathy. I have used it more more than sympathy cards. 122797 c 128652 w.
Do you have a go to set for sympathy?